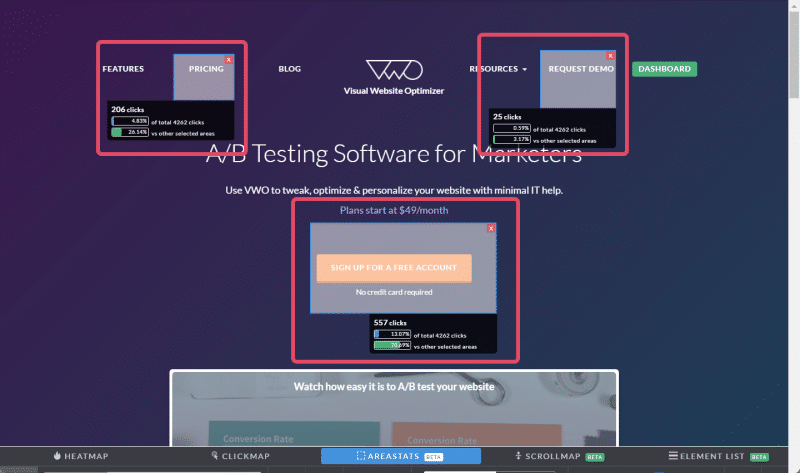 A VWO heatmap generates a visual report to help you identify sections of the website which receive maximum visitor attention. Based on the report, you can determine where to place your most important CTA buttons and links. 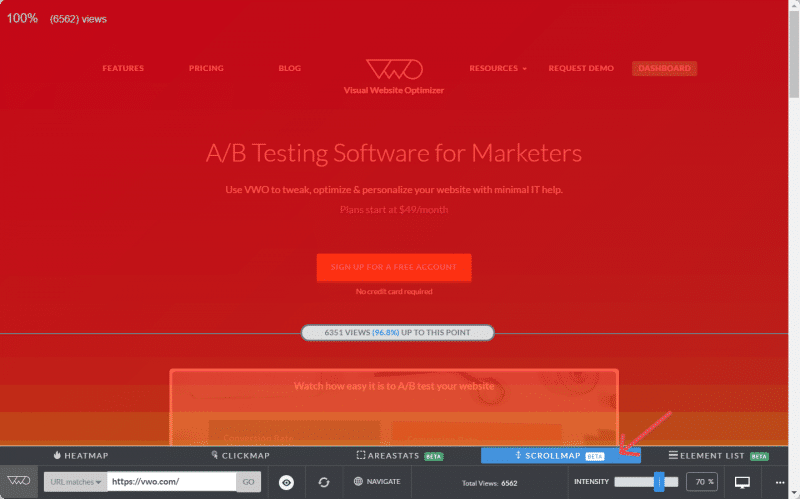 To access the reports section of your VWO dashboard, click Heatmaps under Analyze. On the Heatmaps dashboard, under the Views tab on the right, select the view for which you want to view the Heatmap report. The number of clicks displayed in the Heatmaps dashboard is the total number of clicks from the day you started using the heatmap. The number of clicks displayed here includes all heatmap data collected for the website, including visitor data on the pages even when your account is inactive. To view specific click recorded for a page, select or create a view to track heatmaps. Reports Type: Select the report type you want to view—heatmap, clickmap, clickarea stats, scrollmap, or element list. Click Add Observation to note down a comment or observation you made on the report. To learn more about adding observation from a report, click here. URL: For multiple URLs, you can switch among reports of different pages. Refresh: Refresh the reports page to view updated data. 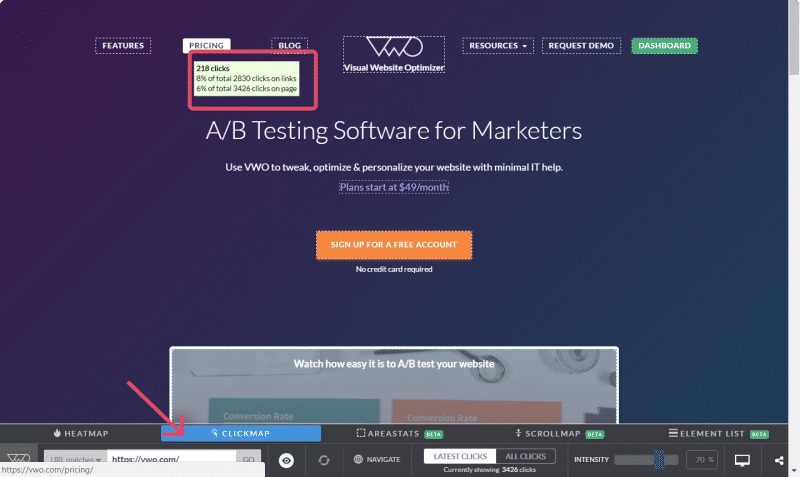 ATTENTION You can also view heatmaps on dynamic URLs such as pages behind sign-in, checkout pages, and so on. Clicks: Displays the total number of visitor clicks on the page. Switch between Latest Clicks (latest 5000 clicks by default) and All Clicks to view. Intensity: Use the slider to increase or decrease graphic intensity on the reports. Device Type: Filter your reports based on the data collected based on visitor device type such as desktop, phone, iPad, and so on. Share: Click the option to share the heatmap link with others. 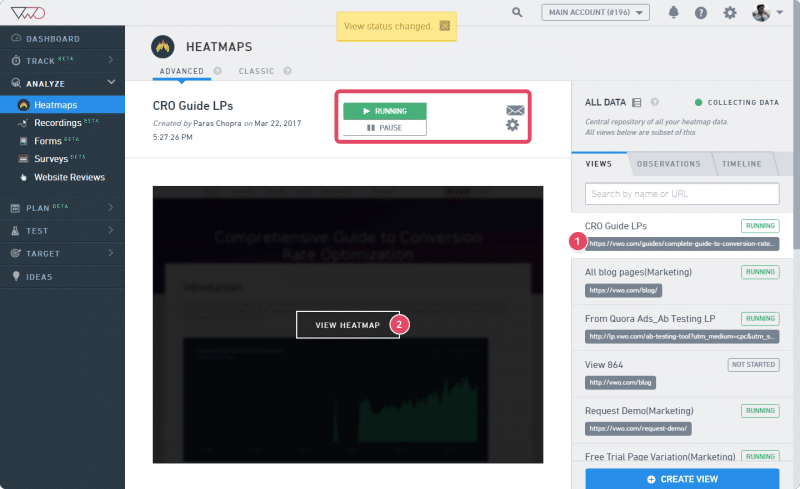 Download: Use this option to download screenshots of the heatmaps report. 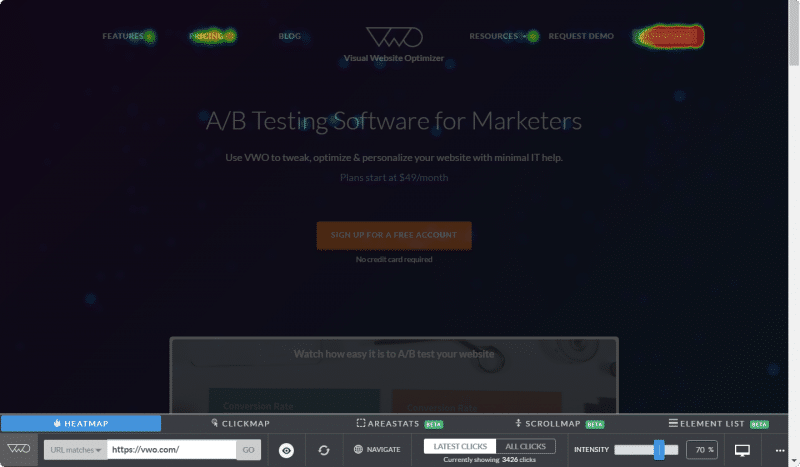 PRO-TIP As VWO plots heatmap on the live website, it is recommended that you download the heatmaps of a page before making any changes to it. View the graphical report of how visitors interact with a webpage. The brighter area represents maximum interaction, and the darker shades indicate lesser activity. For heatmaps created as part of a test, the maximum number of clicks that can be plotted on the heatmap report is 100k. However, there is no limit to the number of clicks plotted on standalone Heatmaps created under Analyze layer for visitor research. Note: By default, Safari browser blocks third-party cookies. 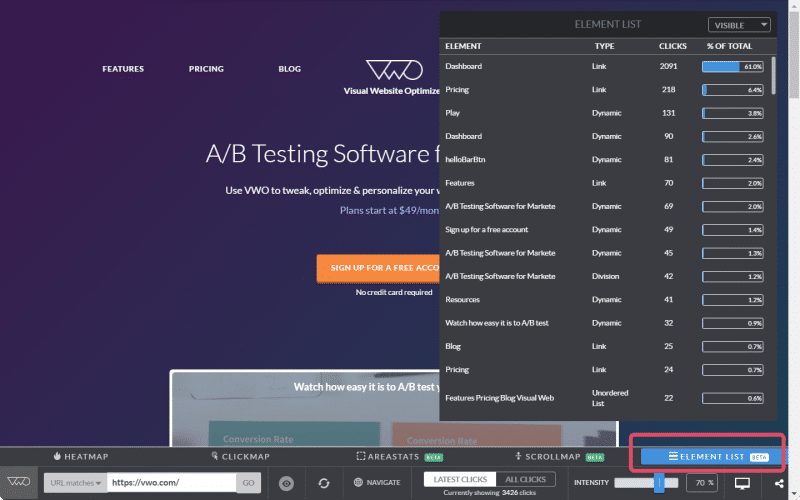 To load the heatmaps data correctly, click Safari > Preferences > Privacy and disable the Prevent cross-site tracking option. Click the Heatmap tab on the reports page. The bright color spots indicate high activity, and the light colors indicate low activity. In other words, the bright spots are where maximum number of visitors click or tap. Click Add Observation to note down a comment or observation you made on the report. To learn more about adding observations from a report, click here. Find out the exact number of clicks on specific sections of the page—links, images, dead space, text, or any element on the page. You can compare the clicks of different variations and measure if the result improves. Click the Clickmap tab on the reports page. Hover the mouse over the link or section of the website you want to track—links, images, dead space, text, or any element on the page. The number of clicks and the percentage of visitor is displayed on the mouse-over text. Identify the most active and scrolled sections of your website. Track how many visitors actually make it to the middle or bottom of the page and where they abandon the page. Sections, where visitors spend most of the time, should contain key elements of the website. Click the Scrollmap tab on the reports page. The most active and scrolled sections of your website page are displayed in brighter shades of different colors. Compare between two sections of the same page to measure clicks and moves. This data is useful to track which sections get ignored or which sections should be prioritized. You can also check if the changes implemented on a section are making any impact on visitor behavior. Click the ClickArea tab on the reports page. Click and select the sections you want to compare. View the activities on each element on your website, including links, headers, list items, div, and so on. For each element on a particular page, you can view the number of clicks. Click the Element List tab on the reports page. View the list of elements on the page and the related visitor data captured for each element.